The winged football helmet is a helmet bearing a distinctive two-toned painted design that typically has sharp outward curves over the forehead forming a wing. It is worn by many high school and college American football teams, most popularly by the University of Michigan Wolverines. Famed football coach Herbert "Fritz" Crisler is credited with first painting the winged helmet in school colors. In 1935, while head coach at Princeton University, Crisler ordered stock helmets bearing leather wings out of the Spalding catalog, believing the design to have practical advantages on the field. In 1938, Crisler became head football coach and athletic director at the University of Michigan, where he added maize and blue coloring to the stock design. 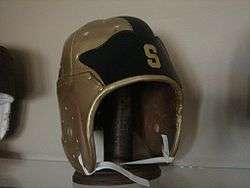 These helmets made their debut at the Wolverines' 1938 season opener against Michigan State and have been worn ever since. It has become an icon of Michigan's football program, which held it exclusively for more than seventy years. 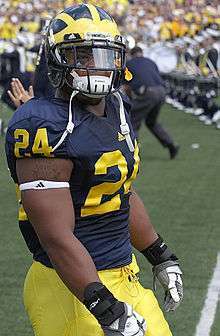 Crisler once recalled his rationale for the design: "Michigan had a plain black helmet and we wanted to dress it up a little. We added some color and used the same basic helmet I had designed at Princeton." There was one other consideration. Crisler thought this unique helmet could be helpful to his passers as they tried to spot their receivers downfield. "There was a tendency to use different-colored helmets just for receivers in those days, but I always thought that would be as helpful for the defense as for the offense," said Crisler. 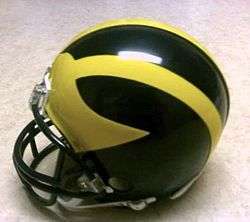 While the Wolverines have traditionally and historically held a claim to the winged helmet as their own, several other organizations have employed similar or identical designs. Michigan State began wearing a variation of the winged helmet before 1938, predating the Wolverines and continuing until 1948. Princeton abandoned the design after Crisler left in 1938, but in 1998, resurrected the winged design (in orange and black) for the Princeton Tigers. When David M. Nelson, a former Michigan player, became the head coach of the University of Delaware's football team in 1951, Delaware began using a blue and gold winged helmet, which they use to this day. Several high school teams across the country have also adopted the design. In 1996, the Connecticut Coyotes of the Arena Football League wore very unusual red, white, and blue winged helmets, making them perhaps the only tricolor winged helmet design in the history of American football. 1 2 3 "University of Michigan Football: Michigan's Winged Helmet". University of Michigan Athletics History. Bentley Historical Library. 2006-04-10. Retrieved 2011-02-24. ↑ "Arena Football League". nationalchamps.net. Retrieved 2016-04-17. ↑ "Helmets of Discontinued College Teams". nationalchamps.net. Retrieved 2016-04-17.